Making food, this peanut butter for instance, from scratch has advantages that are numerous and varied compared with purchasing their commercially produced counterparts. Clearly, the advantage my blog is most keenly interested in is the fact that making one’s own food is cheaper 99 per cent of the time. However, there is one only slightly less obvious argument for doing so – it makes it far easier to control exactly what goes into your recipes and diet. For instance, even the most expensive supermarket brands of peanut butter contain palm oil, an ingredient both unnecessary and environmentally immoral – it has caused the destruction of the natural habitat of thousands of species of animals worldwide. The less said about cheaper products the better, for their recipes also contain brown sugar and peanut oil, in addition to palm oil. All of this unnecessary, environmentally damaging and unhealthy produce in a spread that really only requires two ingredients; peanuts and just a smidge of salt. The trick to employ when making peanut butter is to process the nuts so much that they give up their natural oil – where’s the sense in adding peanut oil to peanuts?! Remember, they may at first appear to possess the unappetising quality of sand, but after a good four minutes of vigorous encouragement you’ll be in possession of the finest damn spread on Earth, that is, excepting marmite – I love that stuff. 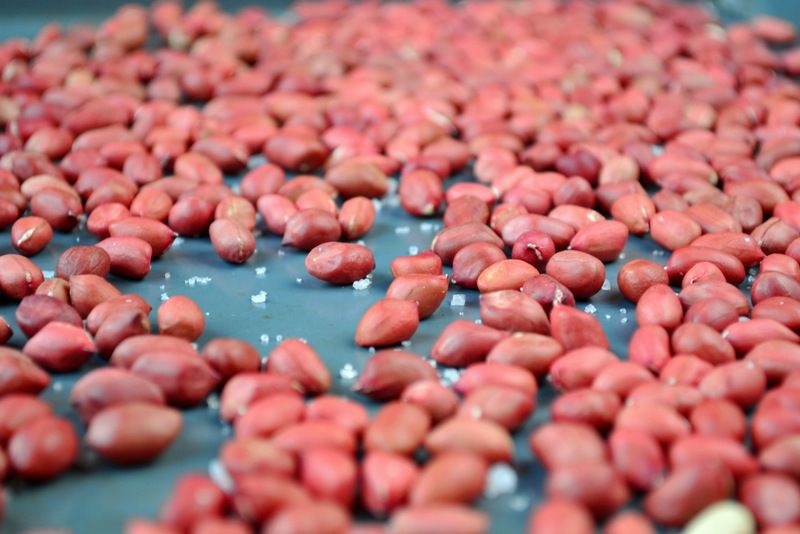 Flavour wise, I heartily encourage you to roast your own peanuts – salted peanuts tend to be of lower quality and, again, contain palm oil and sunflower oil. There’s something about home-roasted nuts that immediately trumps those that are pre-roasted – perhaps it’s the presence of the natural brown skin that lifts the flavour just that little bit? Either way, once you’ve tried this, you’ll never go back… it is seriously good, far healthier and exceedingly frugal. 1. Pop the nuts in a roasting tin with the salt and roast at 180C for 5-10 minutes. When done they’ll be crunchy all the way through, but make sure they don’t burn – it doesn’t take much. 2. 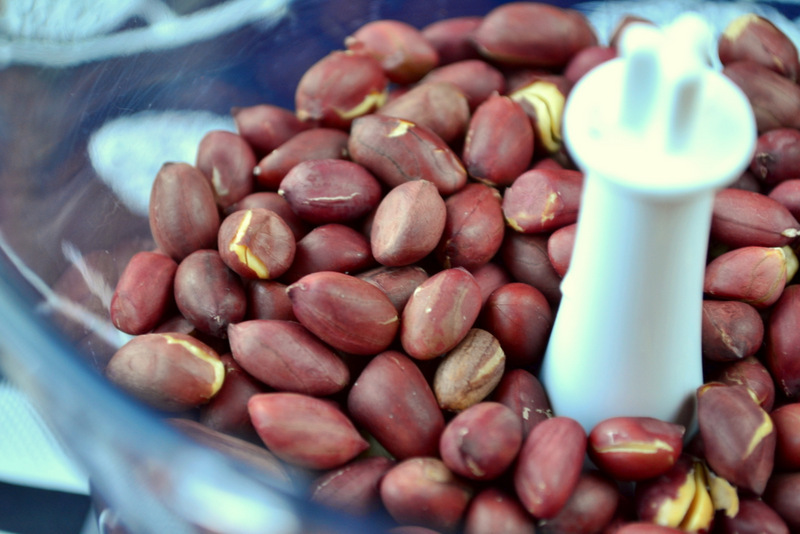 Leave your nuts to cool a little before popping them in the food processor and whizzing for 4-5 minutes until a smooth paste is left – you’ll know when to stop… if in doubt, carry on. Cost: A two-ingredient recipe is almost always going to be cheap. Depending on where you get them from un-roasted peanuts may be a little more expensive than roasted peanuts (which doesn’t make sense), but it’s worth it since they don’t contain anything superfluous. You’ll soon be enjoying this peanut butter for the frugal price of £1.30, far less than the £3.10 asking price of the top-end stuff in supermarkets! This sounds delicious. I might have to attempt it with almonds! Almond butter is my favorite and I would much prefer to make my own. Thanks! Please do! I think the process would be similar. I am a peanut butter freak! Use it in smoothies everyday. Have you tried making it from almonds? It’s great isn’t it?! Nope, but I plan to eventually. I am eternally grateful that in the US finding “natural” PB is easy to find 🙂 I grew up it so the partially hydrogenated stuff with palm oil is weird to me. Too sweet, too thick and too salty!! That is good! It’s harder here by far. Yes, I find it easy to get PB made from just peanuts (and usually, but not always, salt) in my part of the US, too. I hope it soon becomes more available in the UK. Here in Pittsburgh we have a natural foods co-op store where you can grind your own peanut butter into a jar you bring! It is quite tasty, and it’s fun to watch it come out of the grinder, though it tends to fall into the jar such that there are lots of air pockets and you have to keep shaking it down. Nuts in jars, however, may be coated with all sorts of oils. I’m just starting to be more alert to the labels, after realizing that I was eating cashews coated in COTTONSEED oil–cotton is one of the most heavily pesticided crops and not even a food! Yuck!! Indeed, the problems of many processed foods are easily avoided with a little knowhow and effort. Keep up the good work! They are indeed! Thanks, I shall try. You can make Nutella in a similar fashion by Whizzing roasted hazelnuts with cocoa and sugar to taste. Oh my, my waist line is inflating just thinking on these ideas! I keep meaning to try that one, thanks for the reminder Jo! No problem! So do I lol…. Duly noted… I’ll give it a go. Oh that looks wonderful. But I’m a fool for peanut butter. Did I mistakenly think only Americans craved peanut butter?? Thanks! Very mistaken… it’s amazing! Fantastic post! Do you think this method would work equally well with almonds? What? I had no clue how quickly one could make their own peanut butter! I look forward to trying! I buy a brand called Adam’s which is just peanuts and salt as well, and I can probably buy it cheaper than I can make it, but sometimes homemade is just too good to pass up. I’m totally intrigued that you used peanuts with the skin still on! That must taste incredible. Oh that’s great! It does, the skin really adds something. Awesome, Somer – you’lllove it! I love that you are making everything from scratch, I have never tried creating my owm peannut butter, but after reading your post I will for sure. Everything is just so much better made from scratch. Great post, wee should all make more of our own produce, I will be making this, thanks for inspiring. I made my own tahini paste, my own hummus, now it’s time for my own peanut butter 🙂 Thanks for this encouraging post. I made my own pb several times (and other nut butters) but never thought of roasting my own peanuts. I’ll have to try that – thanks for the idea! And thanks for liking my antichef blog! Think i will give this a shot as i sadly use the processed stuff for convienience! How frugal of you! In all honesty, I like making my own peanut butter too! Like you I hate the addition of sketchy ingredients to my peanut butter and also can’t justify overspending on something that can so easily be made at home. Other than my beloved peanut butter, I can highly recommend making walnut butter at home, again, super easy and walnut butter is velvety smooth and is perfect eaten on a slice of toasted sourdough bread with a sprinkle of fleur de sel and a drizzle of honey. Sadly, walnuts cost an arm and a leg in Italy so I will have to wait till Christmas to stock up on supplies when I go home. That’s my name (sorta) :D. I’ll give it a go, but you’re right… not too cheap. Wow! Who knew that making a homemade jar of peanut butter could be so simple an affordable. Goodbye GMO, over-processed, sometimes salmonella infused peanut butter…hello wholesome, healthy, real peanut butter! So easy, so yummy, so frugal! Thanks, Nick! I keep forgetting that I can make my own. No problem, Daisy! Do it! That’s a good idea, I do like crunchy peanut butter. My those are some smooth looking nuts. Haha – I like smooth nuts. Just got a brand new blender/food processor and can’t wait to try out homemade PB. Just not sure anyone in my family besides me will eat it if it’s slightly chunky. Fantastic! Well, this isn’t chunky at all! 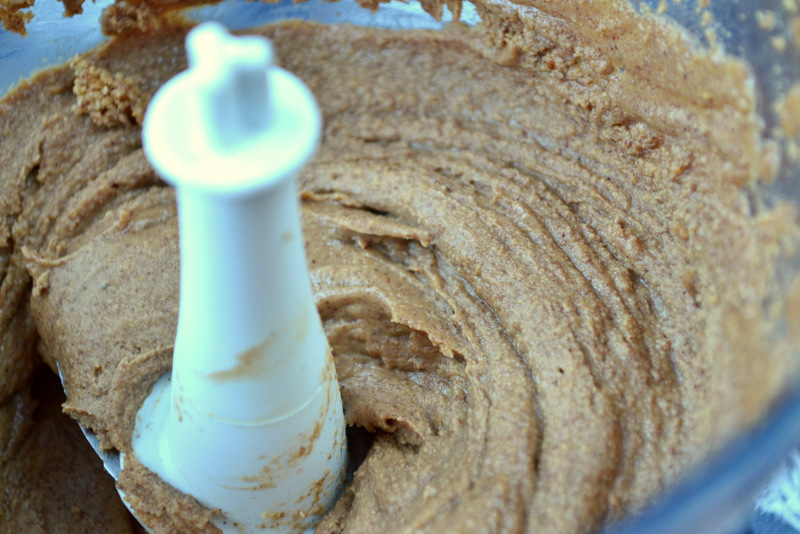 I love homemade nut butters! And you’re right, they are way cheaper to make yourself. Interesting. I have a ton of pecan trees and pecans up the wazoo so I think I shall send the kids out to collect them and have a go at that too. Oh yes, you’re all set then! 🙂 Here’s the link if you’re interested! Fantastic! I’ll check it out for sure. Brilliant! I can’t believe I hadn’t thought to do this until now! Everyone in my family loves peanuts and peanut butter…I can’t agree more, preparing food yourself is not only better for your budget, it’s also better for your body! Thanks! Give it a go – so simple! We definitely do! Though, not as much as Americans. Exactly! Though, my mum didn’t really do that much (though she is a good cook) and I’m strong and infection free :D. Thanks! Great Idea, cheap and a way to avoid palm oil and the damaging enterprises associated with it. This will be perfect for my chocolate and peanut butter ice cream. Thanks!. Can you tell me the best way to keep this, refrigerated? Do you think jars could be processed as in canning? Nope, in a jar in the cupboard! Where do you get your unroasted peanuts? I don’t recall finding any bulk bins of nuts (off the top of my head) at Tesco or Asda.here in the US I can find them at a local store but as I am moving back to the UK soon any tips would be appreciated. I have the advantage of living in SC USA so raw peanuts are readily available. I believe they are seasonal and available only in the fall and winter. You see vendors on the roadsides here selling hot roasted peanuts from a kettle all winter. We always have them here in the UK too! That sounds yum! I try not to shop in supermarkets, try a health food shop. I make all sorts of nut butters, pecan is my all time favourite, but cashew is good too. All power to REAL food I say. Great ideas! I’ll get round to them eventually. Another great idea! Peanut butter is always more expensive than I want it to be. Thanks! I know, it can be very dear. Homemade peanut butter is worlds better than anything you can get at the supermarket, plus you have so much creative liberty! I love to add a dash of vanilla to mine, or a bit of cocoa powder and brown sugar for a nice treat. The possibilities are endless! I once saw the idea for a “trail mix butter’ that included peanuts along with chocolate candies, dried cranberries, raisins, and I believe they may have even been some pretzels thrown in! Indeed! I shall be experimenting eventually! Particularly with the cocoa powder. We go through lots (lots!) of peanut butter at my house–I should make it more often. 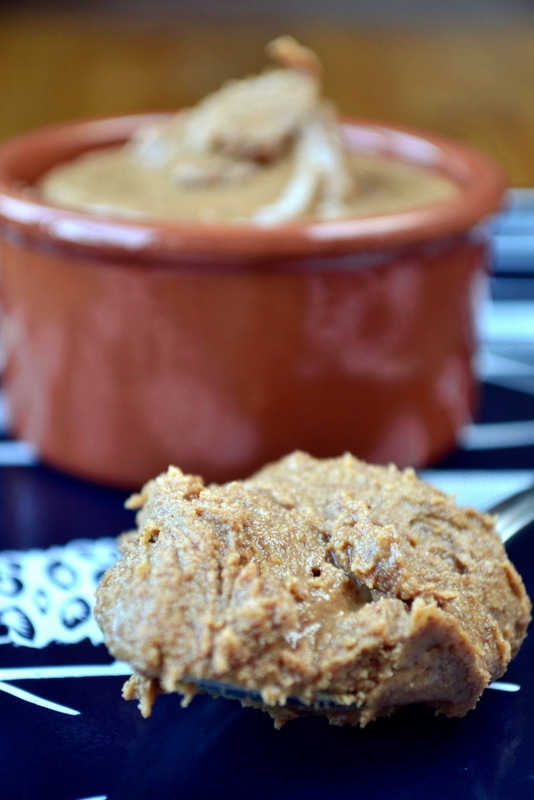 Fresh-roasted homemade nut butters are so delicious. Thats a WOW….!! We make a peanut chutney in India, using couple of other ingredients too. I tried store bought PB once. tasted it and just put it in the bin. When peanut goes in any recipe It has to be a star. I know this is a star. And whats the shelf life of this recipe ??? I’ve heard of peanut chutney, the idea is a little strange to me… Shelf life is very good, been out a week now. Yes that sounds like you! I’m sure that I used to buy peanut butter that contained nothing but peanuts and salt but I’ve forgotten which brand. Suma? Meanwhile I don’t eat peanut butter very often at all, now, because my digestive health’s not what it used to be (multiple sclerosis messes with all kinds of things) but I like the look of your recipe. Of course :D. Suma may well do that… I’m not sure though. Thanks for the heads up – I’ll check it out! Just wondering wouldn’t it be a good idea to remove skin after roasting peanuts or does it add xtra flavour to it?